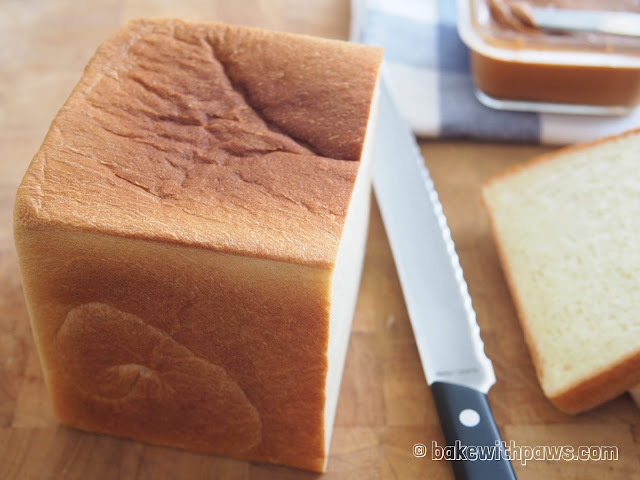 I have been working on a recipe for a soy milk loaf. Tweaking it with each attempt I have found a recipe to keep! This is especially healthy as it is made with my homemade soy milk. 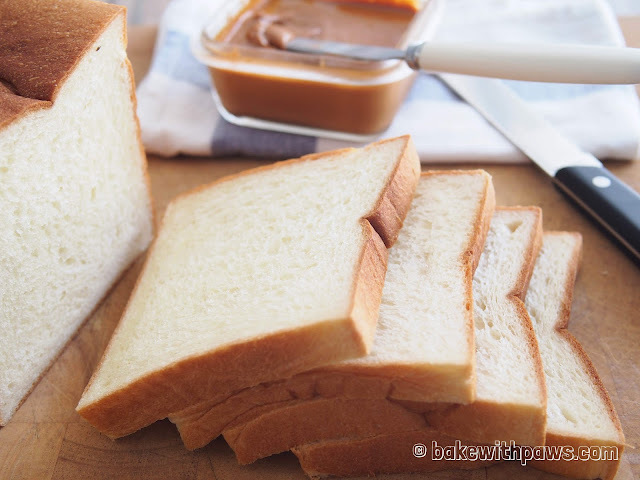 The original base recipe was something I found in a Bread Baking book. 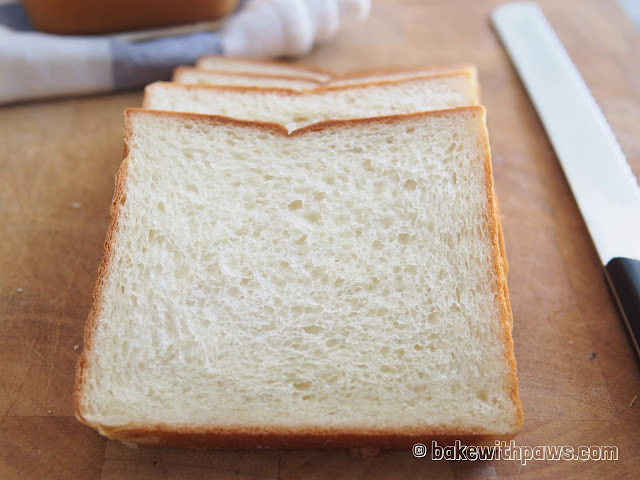 My hubby comments that the texture is very close to Gardenia Bread. Yahooo! I am so pleased. Please refer to the method of making Tangzhong here. Utensil: 12x25x11cm pullman loaf pan, lined with parchment paper or non-stick baking sheet. 1. Put all ingredients and Tangzhong ((first add salt, flour, sugar, yeast, milk powder, coconut oil/butter, Tangzhong and lastly 170g soy milk) in a bowl of stand mixer and knead till the dough come together, until achieve window pane stage (the dough at this stage should be able to be pulled and stretched into membrane). It takes around 10 to 15 minutes at medium speed. If the dough is too dry, add 1 tablespoon of soy milk at a time until you get the consistency you want. 2. Form the dough into a round ball and let it rise in a warm place for 60 minutes or until double in size in a large greased bowl, covered with cling film or kitchen towel. I normally leave the dough in the stand mixer’s bowl and cover with kitchen towel. 3. Punch down the dough to release the air. Transfer the dough to a clean floured surface then divide into 2 equal portions. Roll out each dough with a rolling pin into rectangle shape. Roll up like swiss roll until a short log is formed. 4. Place in the prepared pullman loaf pan. Cover the lid and let it rise for another 60 minutes. 5. 15 minutes before baking, preheat the oven to 200C (180C for fan mode). 6. Bake in a preheated about 45 minutes. Remove from the oven and transfer onto a wire rack. Let cool completely before slicing. I used homemade soy milk which I didn’t filter. The bread turned out a bit dense. I think you will get more light texture if you use the ready-made soy milk. Wow. This looks perfect and I believe, that this will be the best loaf to eat in the breakfast. Thanks for sharing the recipe to make me able to bake this. hi :) I am excites to try this recipe as I just made soy milm at home! unfortunately my soy milk is already lightly sweetened. may I know if I need to reduce the amount of sugar in the recipe? Thank you! Thank you for dropping by. Is your soy milk very sweet? You may cut down half of the sugar amount or 10g less. It is depend how sweet you would like your bread to be too.